The Ultimate in Computer Chassis - Mountain Mods award winning U2-UFO. 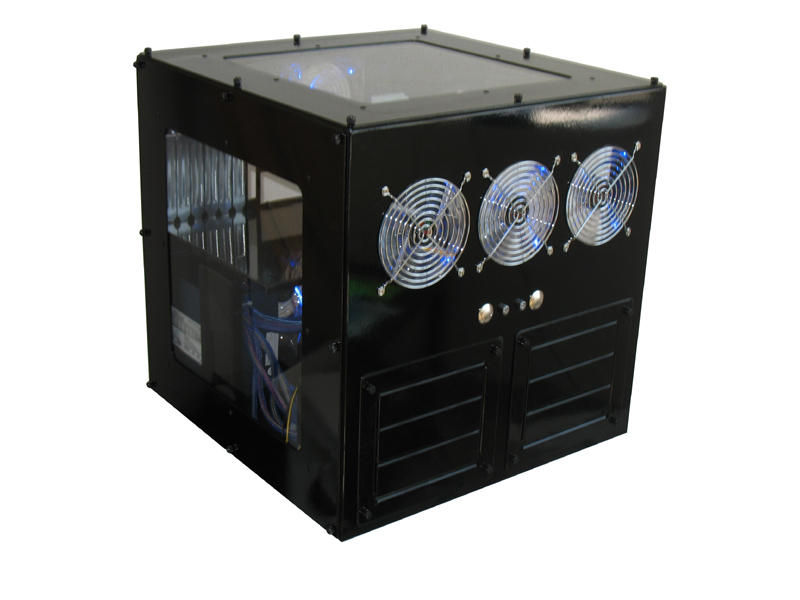 Triple 120mm intake fans align with the Thermochill 1203 radiators. Two Power Supply ports allow for use of dual or redundant power supplies for the heaviest of loads. An acrylic plate covers the optional port. The U2-UFO is fabricated by skilled workers in the USA. It is made from thick aluminum making it lightweight, sturdy, and thermally friendly. Casters are included for easy mobility. The Horizon series of the U2-UFO offers a horizontal positioning of the motherboard. The Motherboard sits above the other components allowing it to be seen in all it's glory from the top panel. Two 3x5.25 bays allow for the use of up to six 5.25 devices. A brace is integrated into the design to support the motherboard in it's horizontal position.